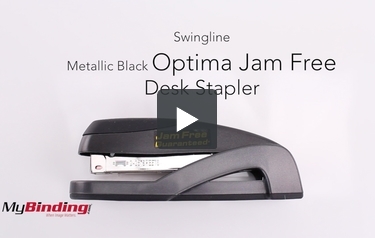 The Swingline Optima Desk Stapler, keeps you jam free, guaranteed! 25% greater capacity than other desk staplers, staples 2-25 sheets. Designed for the way you work, the Swingline Optima Grip Stapler is ergonomically designed specifically for handheld use. Jam free from the first staple on the strip to the last when used with Swingline S.F. 4 Premium Staples. 100% performance guarantee. 25% greater capacity than other desk staplers, staples from 2-25 sheets of 20 lb. paper with S.F. 4 Premium Staples. Increased strength, superior reliability, metal construction. Features a unique blend of soft feel materials to enhance handheld stapling comfort. Smoothly contoured for the best handheld precision stapling. Can stand up on end for easier handheld grab to use. Recommended for use with Optima Premium Staples. Holds a full strip. Welcome to MyBinding video. This is a look at Swingline's Optima Grip, a jam-free desk stapler. Ergonomically designed with a jam-free guarantee, the Optima Grip is a great stapler. It can punch from two to 25 sheets per punch, is lightweight yet sturdy, and feels great in the hand. Loading is simple: snap it back, place it in, snap it back, and give it a little squeeze and you're on your way. There it is, the Optima Grip by Swingline. For more demos, reviews, and how tos, check out MyBinding.com. The Swingline Optima Grip is one of the best desk staplers you can buy. This device features an unheard-of stapling capacity, jam-free operation, and an ergonomically friendly design. Here are this product's strengths (and weaknesses) so you can decide if the Optima Grip is right for you. The Optima Grip has a terrific stapling capacity. It can staple as many as 25 sheets or as few as 2. The 25-sheet capacity is 25% greater than other desk staplers that can typically only fasten 20 sheets together. Thus, this is a great device to get if you want something that can handle a fair amount of paper. This product was designed to be ergonomically friendly. Using it is very comfortable especially compared to its all-metal counterparts. This device even has materials that are soft to the touch on it, so you can staple a lot of documents without getting fatigued. Plus, this stapler stands up on one end so you can grab it and get to work with it easily. The stand-up design will also free up some room on your desk which is always nice. The Optima Grip is unlikely to jam up on you so you'll be able to fasten your papers without any hassle. It won't even jam when you get to the last few staples unlike some of the other devices on the market. This product even comes with a 100% performance guarantee so you can be confident it will work properly every time you use it. You can use this device for tacking items to a bulletin board or other surface. Just open the stapler up and you can get started. Although the Optima Grip is soft to the touch, it still contains metal parts. This way, you can be confident that it's durable and can be used frequently. It comes with a limited lifetime warranty as well. Although the Optima Grip has a stapling capacity not frequently seen in desk staplers, it still can't be used for really thick documents. You should have access to a bigger device if you plan on working with long documents. This isn't a particularly big device so it wouldn't be a good choice if you need one with a long reach. If that's the case, the Swingline Long-Reach Stapler would be a better choice. Overall, the Swingline Optima Grip is one of the best staplers available at the moment. It has a really great stapling capacity so you'll be able to staple longer documents. You'll like the way this device feels in your hand and that you can grab it from a standing position. The jam-free performance is also a major plus because there are few things more frustrating than dealing with a jammed stapler. And you'll find that this device is durable and that you can get a lot of use out of it. If you need a desk stapler, the Optima Grab is one you should grab a hold of.